Demonstrators flocked to Hart Senate Office Building after USCP cordons off East Front. The U.S. Capitol Police arrested hundreds of people protesting Supreme Court nominee Brett Kavanaugh’s pending confirmation in the atrium of the Hart Senate Office Building on Thursday. Protesters initially planned to hold their rally on the East Front of the Capitol, but USCP cordoned off the area Thursday morning. So the demonstrators streamed into the Hart building, chanting and singing against Kavanaugh, whom multiple women have accused of sexual assault. Around 3:30 p.m. Capitol Police arrested 293 protesters in the Hart Atrium and charged them with "crowding, obstructing or incommoding." There were nine additional arrests around 5:20 p.m. in Dirksen near Maine Republican Sen. Susan Collins&apos; office. Those protesters face the same charges. 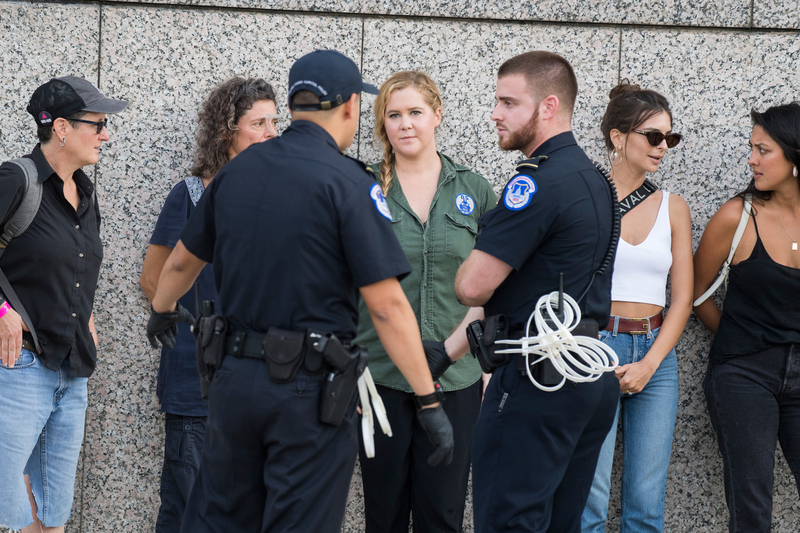 Among the arrested: comedian and actress Amy Schumer, a distant cousin of Senate Minority Leader Charles E. Schumer of New York, and model Emily Ratajkowski. This isn’t the first time Schumer has taken up a political cause. In 2016, she publicly supported President Barack Obama’s efforts to tighten the country’s gun laws. Thousands of women, including scores of sexual assault survivors, marched the ¾-mile strip of Constitution Ave. from the federal courthouse in D.C. where Kavanaugh currently presides to the steps of the Supreme Court on Thursday. They held signs reading “Believe Survivors,” “November is coming,” “#CancelKavanaugh,” and “No abusers on the Supreme Court,” and chanted along the way. “Last week, we proved that people coming together and sharing their stories can change the course of history,” Ana Maria Archila, co-director of the Center for Popular Democracy Action, one of the planned protest’s organizers, said in a statement Thursday. The American Civil Liberties Union organized a protest with hundreds of people from Alaska, Nebraska, West Virginia, Colorado, and Maine. Alex Gangitano, Katherine Tully-McManus, and Thomas McKinless contributed to this report.